Hinduism is the oldest living religion. It has a long and continuous history of over 7000 years, assuming that the Indus valley civilization began around 5000 BC. According to Subhash Kak and David Frawley, excavations done at Mehragarh, which is located at Bolan Pass in Baluchistan, reveal that it was the "largest town of early antiquity," covering over an estimated area of 500 acres and dating back to 6500 B.C. Compared to it, Jericho the oldest city in the world (9200 B.C.) was about 10 acres in area. Jaramo another city of antiquity (7000 BC), covered just four acres, with "no more than thirty houses." Only Catal Huyuk, another ancient city was "roughly comparable to Mehrgarh." The discovery of Mehrgarh proves beyond doubt that the Indus valley civilization began at least 3000 years earlier than the previous dates ascribed to it and the development of urban centers in Asia began in the early Neolithic age itself, rather than later. There is a growing opinion that the Vedic civilization was a continuation of the Indus valley civilization. The Indus people were believed to be a heterogeneous population consisting of diverse groups of people who probably spoke different languages and practiced different religious traditions, while they owed their allegiance to a common ruling elite. Contrary to the popular opinion, the Indus valley civilization did not disappear into the sands of history. It continued to flourish in different parts of the country in different guises of them probably the Vedic tradition was the most significant. 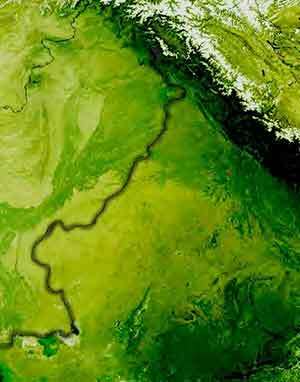 Satellite imagery, archeological, literary and linguistic evidence suggest that the Vedic civilization which is now referred to as the Sindhu-Saraswathi civilization, flourished in western India, in the area now comprising the desert, along the banks of an extinct river which was known to the Vedic people as the river Saraswathi. Prior to the migration of the Vedic people to the Gangetic valley, which happened around 2000 BC, they regarded the river with great reverence and referred to it in the rituals. The Rig-Veda, for example, considers the river Saraswathi, not the Ganges, as the most sacred and auspicious river. It is suggested that due to climatic changes the river eventually drier up, forcing people to migrate eastwards toward greener pastures and establish new settlements. Contrary to the popular opinion, Hinduism is not just a extended version of the Vedic tradition. Actually the present day Hinduism is much different from the Vedic religion that was practiced in the Indian subcontinent during the Rigvedic period. Most of the gods whom the Hindus worship now were not known or relatively unknown during the Vedic period. Over these centuries, however, it assimilated many diverse traditions, some of which were prehistoric in origin. These traditions contributed richly to the diversity and complexity of the religion and enable it to survive the onslaught of more established and organized religions such as Jainism and Buddhism in the ancient times and Islam and Christianity in recent times. Some of the prehistoric traditions which joined main stream Hinduism in the course of its long history are listed below. 1. Fire rituals. The worship of fire for its destructive as well as beneficent abilities dates back to prehistoric times when man discovered the use of fire for domestic and agricultural purposes. 2. Bathing rituals. The Indus people constructed large baths probably for ritual purposes. The tradition continued during the Vedic period. Even today water is an important component of Hindu rituals. Most of the traditional temples of India contain a water tank where people take a bath before entering the temple premises. 3. Fertility rites. There is evidence to suggest that the Indus people practiced fertility rites and worshipped Mother Goddess. The tradition continued during the Vedic period and also post Vedic period. Tantra and worship of Shakti occupy an important place in Hinduism. 4. Nature worship. The Indus seals depict worship of trees, plants, animals birds, snakes, rivers, lakes, mountains, and mythical creatures. The practice continues even today in various parts of India, especially in the rural areas. Nature is regarded in Hinduism as an aspect of God which is responsible for the material manifestation and the modifications of the objective universe. 5. Healing and magical rituals. Prehistoric people practiced magic and healing rituals to deal with disease, injuries and snake bites. Similar rituals are practiced in in Hinduism even now. 6. Human and animal sacrifices. Human and animal sacrifices were common in ancient India. The tradition continued subsequently, but mostly symbolically with the help of symbols and images rather than actual people and animals. Even now animals are still sacrificed by some in certain parts of India on special occasions. They are however strongly discouraged on both moral and religious grounds. 7. Spirit and ancestral worship. Ancient tribes worshipped spirits and ancestors and sought their help for food, protection, progeny and predictions about future. These elements found their way into Hinduism and are practiced still in certain parts of India and in places like Bali even now. Being an organic religion which evolved continuously since prehistoric times, Hinduism contains within itself some of the best and the worst practices. Thanks to the contribution of numerous scholars, saints and philosophers, the tradition morphed into a complex set of beliefs and practices which make it very flexible and responsive to the changing sentiments and spiritual aspirations of the people. Hinduism has the ability to appeal to a wide range of people with diverse beliefs, needs and temperaments. Regarding the integration of tribal traditions into Hinduism, the following are also worth mentioning. 1. Tribal tradition are still practiced in many rural and tribal areas of Hinduism and considered part of Hinduism only. 2. Many gods and goddess worshpped in the past by tribal communities are now considered aspects of principal Hindu deities such as Vishnu, Siva, Shakti, Rama, Krishna and Kartikeya. There are indications that Lord Ganesha, Hanuman and the worship of Mother Goddess are probably rooted in ancient tribal worship. 3. The traditional Hindu method of worship known as pooja in which deities are worshipped with water, flowers, incense and light accompanied by prayers and offerings may have its root in ancient tribal traditions. 5. Some ancient seers like Valmiki hailed from tribal background. 6. 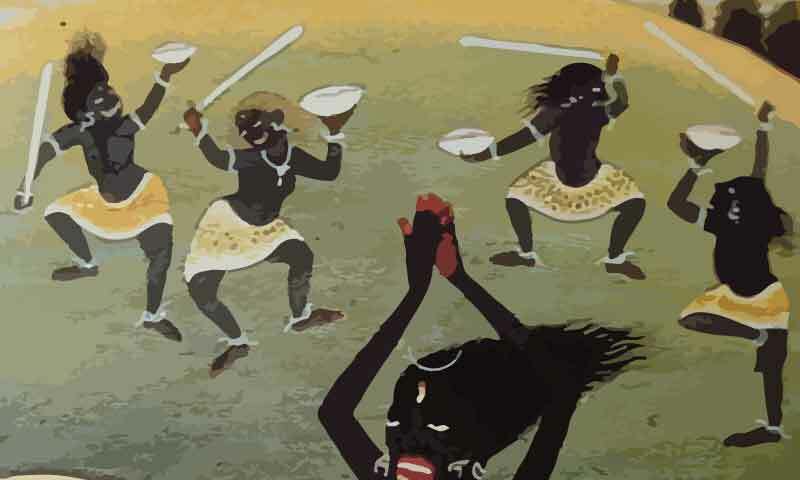 Many ascetic movements acccepted tribals into their fold. 7. Until recent times, tribal communities enjoyed considerable freedom. Their allegiance to the king was higly prized. The same tradition continues even today. Many tribal communities and their right to forest lands is protect by law. Due to climatic and geographic limitations, many tribals still live in isolation in India.